On December 11, 1948, following two months of discussions the Newfoundland and Canadian negotiating teams signed the terms of union that would eventually see the country of Newfoundland become a province of Canada. The Newfoundland negotiating team that went to Ottawa to discuss the terms of union was composed of National Convention members Gordon Bradley, J.R. Smallwood, Albert Walsh, Chesley Crosbie, Gordon Winter, John McEvoy, and Philip Gruchy. 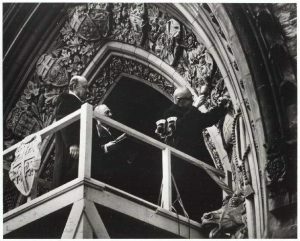 They met with representatives from the Department of External Affairs, including Louis St. Laurent and Lester Pearson, as well as Prime Minister Mackenzie King. The teams worked for a period of approximately two months in 1948, using the draft terms from 1947 as a starting point. Although for the most part the process went smoothly, there were a few stumbling blocks, such as the provision of transitional payments to offset Newfoundland’s deficit. The Canadian government was also reluctant to make firm commitments without a legislature present in Newfoundland. Eventually a mutually satisfactory agreement was completed and on December 11, 1948 the terms of union were signed by all except Chesley Crosbie. Crosbie had been the leader of the Economic Union Party, a party that proposed a free trade agreement with the United States as an alternative to Confederation. He believed that if Newfoundland could export its resources to the United States the economy would be strong enough for responsible government to succeed. He did not sign these terms because he felt that the financial clauses would not allow Newfoundland’s provincial government to balance its books. The irony is considerable, his son John Crosbie, the former Lieutenant Governor of Newfoundland and Labrador, became a prominent politician, serving as a cabinet minister in the government of Brian Mulroney. As the Newfoundland representative in the Canadian federal cabinet he fulfilled his father’s dream and became the architect of the Canada – U.S. Free Trade Agreement. Recommended Archival Collection: In appending their names to the Terms of Union each of the signatories were given a copy. Did you know that the original provincial copy of the Terms of Union with Canada is held at the Rooms Provincial Archives. Recommended Exhibit: Here, We Made a Home in The Elinor Gill Ratcliffe Gallery – Level 4. has a copy of the Terms of Union on exhibit. Recommended Reading: Confederation: Deciding Newfoundland’s Future, 1934 to 1949 by James K. Hiller, St. John’s, Nfld: Newfoundland Historical Society, reprinted with minor corrections 1999. Recommended Reading: Don’t Tell The Newfoundlanders: The Story Of Newfoundland’s Confederation With Canada by Greg Malone. Knopf Canada (2012). This entry was posted in Archival Moments and tagged Confederation, Terms of Union, union on December 9, 2014 by Larry Dohey. Edward Patrick Roche was born in Placentia on February 14, 1874 son of Edward Roche and Mary Riely (O’Reiley) He was educated at St. Patrick’s Hall School and St. Bonaventure’s College, both in St. John’s, and studied for the Roman Catholic priesthood at All Hallows College, Dublin, Ireland, being ordained there June 24, 1897. In 1907 he was transferred to St. John’s where he became Chancellor and Vicar-General of the Archdiocese under Archbishop Michael F. Howley. On February 26, 1915 Pope Pius X appointed him Archbishop of St. John’s. He was consecrated as Archbishop at the Cathedral of St. John the Baptist, St. John’s, on June 29, 1915. It was as a supporter of the return of Newfoundland to responsible government and as a determined opponent of Confederation with Canada he gained much notoriety in the late 1940s. The campaign for confederation found in him one of its fiercest opponents. He was convinced that no good could come to Newfoundland from Confederation. The archbishop argued through the pages of The Monitor, the monthly Roman Catholic newspaper that before confederation could be thought of, responsible government— as promised by Britain — was the way to go. He was actively involved in the 1948 referenda campaigns, encouraging all Newfoundlanders, but particularly Roman Catholics, to vote for the return of responsible government. Roche died on September 23, 1950, a little less than a year and a half after Confederation, after having served as Archbishop for over 35 years. He was buried in the crypt under the main altar of the Basilica Cathedral. Recommended Archival Collection: At the Rooms Provincial Archives explore GN 154 Newfoundland Delegation to Ottawa fonds. This series consists of letters to the Chairman and the Secretary of the Newfoundland Delegation to Ottawa from various societies, business firms, unions, and government agencies concerning the ramifications of confederation with Canada for Newfoundland interests. The series are arranged by subject. This entry was posted in Archival Moments and tagged Confederation, Roche, Smallwood on September 22, 2014 by Larry Dohey.